Elissa and I are creating a piece for Radio National based on the stories and music of Between Footsteps! 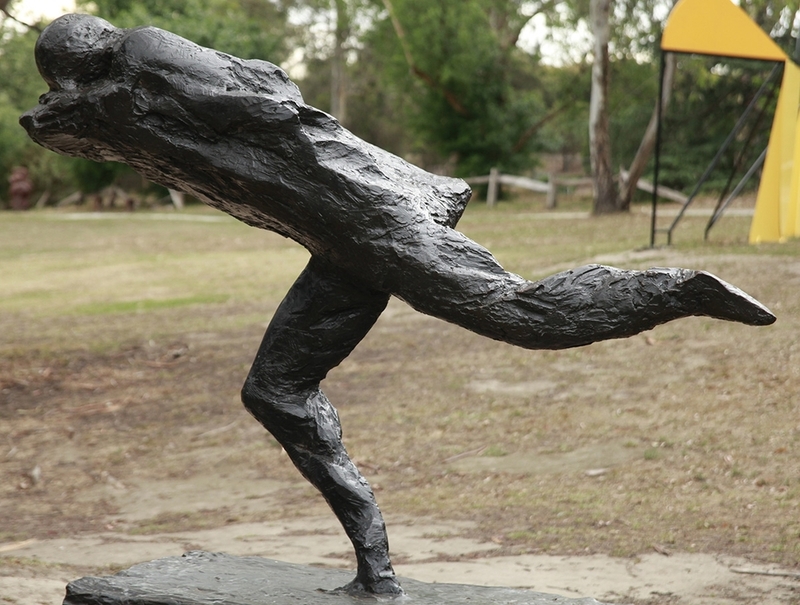 Last weekend we spent two sunny days running around Heide's sculpture park and recording the stories of Tess, Harriet, Scarlet, Jeremiah, Emile, Olive, Grace, Matteo, Archer, Maya and Amelie. Their stories took us to some interesting places full of monsters, storms, running races, planets, dreams, happiness, dark woods, dancing, kindly Badger, naughty Toad, lasers, glistening whales, rain in India, cheerful bunnies, playful dogs, soft toys, castles, starlit skies, evil chasers, thunder, rock stars, dinosaurs, Mars, cannonballs, sad donkeys, big trees, rollercoasters, swimming in the sea, the Moon, ships made out of marshmallows and books, trees that grow chocolate eggs, seedpods, dust clouds, secret passwords, computer beeps, and a rainbow of colours. In the meantime here's one small story that we can share, just to satisfy the creative beast in you. Miss Olive (4) very kindly introduced me to one of the little Donkey's friends. It was a beautiful and colourful lorikeet that came along to cheer up the little Donkey. We settled here for a little while with a picnic and pencils. In fact we could have stayed all day, but there were also hills to roll down and other planets to explore. Did you know the story of the Running Man? We'll I've been lucky enough to hear two stories lately, let me share them with you. Have you got any Running Man stories that you can share with us? Email it to us and we'll post it on our blog so everyone can enjoy your story. Miss L, aged 5, has been thinking about space ever since she heard the Between Footsteps track #6, Spheres and Planets and saw the sculpture, Rings of Saturn by Inge King at Heide. So she made a wonderful sculpture out of some glow sticks, took a spacey photo, and sent it to us so that we could share it with you. We had a wonderful sunny Saturday last weekend with some of our favourite children (and grown-ups) as they played our music in Heide's sculpture park. They told us stories about aliens and chickens, drew us pictures of performing mice and moon bubbles, and made lots of great sounds using sticks, seed pods and whooshing voices!